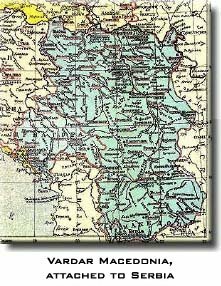 After the Paris Peace Conference, the 25,713 square kilometers and 728,286 inhabitants of Vardar Macedonia were incorporated within the borders of the Kingdom of the Serbs, Croats and Slovenes. For seven years from 1912 to 1918, Macedonia had been a battle ground for invasion and counter-invasion, raid and defense. The countryside was devastated, and the death toll from direct action or hunger and malnourishment high. Immediately after war's end, the peacetime Yugoslav government quickly instituted a renewed authoritarian regime in Macedonia of punishments, reprisals, court sentences and torture. Yugoslav regulations provided for 20 years imprisonment at hard labor for forming "anti-government organizations", and two years imprisonment for instigating strikes. Moreover, the Macedonian people of Vardar Macedonia were official non-existent and the use of the Macedonian language and the term "Macedonian" were forbidden. Radničke novine (Workers' Newspaper) in March 1920 wrote that "the prisoners, who were in the Prilep jail for 10 to 12 months for political reasons, stirred up mutiny. They requested to be taken to court and put on trial. A fight broke out with the guards and, as a result, all of the prisoners were put in chains." Greater Greek, Greater Bulgarian and Greater Serbian politics alike applied generally identical methods and means in their attempts to denationalize and assimilate the Macedonians. 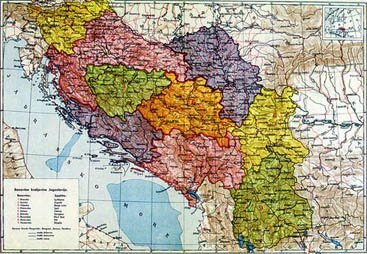 By the "Regulation for the Settlement of the 'New, Southern Regions'" dated September 24, 1920, Macedonian land was granted to colonists from other parts of Yugoslavia willing to settle in the region. This policy was aimed at breaking the cohesiveness of the Macedonian population within their own homeland. By the end of 1928, some data suggests that 6,377 families had been settled in the region on 63,939 hectares of land. Privredni glasnik (Economic Herald) on February, 1921 wrote that "Murders and robberies are committed everywhere. One of the essential operations, agrarian reform, has begun to be carried out in a strange manner. It progressed slowly in one direction then came to a standstill, followed by a turn off the path and a retrogression. A few contradictory regulations and numerous differing interpretations and ministerial announcements caused real chaos. The selfish actions of the agrarian chiefs, the deliyas [brave men] were natural, [those] who in fact became the real masters in regulating the concrete cases. We are witnessing how the true farmers are deprived of their land, given to various speculators who have had nothing to do with agriculture in their entire life." For that reason, it was not surprising that in the local administration elections held in the summer of 1920, a considerable segment of the population voted for leftist parties-especially for the Communists, who gained control of the local administrations in Veles, Kumanovo, Kavadarci and Skopje. In the November, 1920 elections for the Constituent Assembly, out of the total 105,000 votes 40,200 were secured by delegates from Macedonia, winning 15 mandates. not a single person may go from one commune to another without an identity. The Obzana (edict) of December 29 and 30, 1920, outlawed the Communist Party and banned trade unions. Political life in Macedonia was impoverished, and the solid base of the national Macedonian movement was lost, as other political parties upheld Greater Serbian ideals regarding the Serbian character of Vardar Macedonia. Following the murder of Gjorche Petrov, the dissolution of the temporary government and the passing of the December 29 Obzana, Vrhovist armed bands, small bands and individual saboteurs were dispatched from Bulgaria to Vardar Macedonia on an increasingly frequent basis. Their aim was to pave the way for the creation of an autonomist movement in Vardar Macedonia, and for that purpose slogans were used to arouse the anger of the Macedonians against the Yugoslav government. However, lurking in the shadows was still the dream of annexing Vardar Macedonia to Bulgaria. The period from 1922 to 1930 was marked by 63 assassinations in Vardar Macedonia. To answer the Vrhovist challenge or any other resistance against them, state authorities undertook "the white terror," including mass arrests-for example, after the murder of General Kovachevich in Shtip more than 400 people were imprisoned-as well as trials, dismissals from work and torture. To revenge the killing of colonists at Kadrifakovo and of soldiers in the village of Garvan, all the adult males from the village were taken and shot, without trial. In order to maintain "law and order" in Vardar Macedonia, now renamed Vardarska Banovina (the Vardar Regional District), 35,000 soldiers, military policemen, frontier guards and paramilitary bands were deployed. In autumn 1927, the Greater Serbian regime unleashed a new, violent offensive aimed at achieving a Serbian solution of "the Macedonian Question" in Vardarksa Banovina, heralded by the institution of the Dictatorship of January 6. In a letter sent by the zhupans (heads of administrative districts) and the military police commanders in Vardar Macedonia to the Prime Minister and the Minister for Internal Affairs dated December 1927, a dozen measures were proposed under the pretext of combating infiltrators. But the ultimate aim was the denationalization of Vardar Macedonia and the creation of a police state. The situation in Vardar Macedonia became desperate. A report of the Ministry for Internal Affairs dated November 22, 1926 states "in the towns and, particularly in the villages, the people are underfed... in the villages food mainly consists of rye bread, onions, vinegar, salad and yogurt. Salt is very rarely used because, as the peasants say, it is very expensive. Meals are rarely cooked or fat and oil used as the people are generally fasting. I counted 260 fasting days in a year... Owing to malnutrition, [children and new-borns] are in bad condition. There are communes where the recruits look miserable and the percentage of capability is equal to zero..."
In an appeal on February 1, 1928, a group of Macedonian citizens warned of the true situation: "Macedonia is suffering. What is going on here cannot be endured any more. A time has come when we here do not know whether when night falls we will live to see the dawn, or when it dawns whether we will live to see the night. People here are in a desperate situation. On one hand, Protogerov sends his bands to commit assassinations, the result of which is always that innocent Macedonians suffer. On the other hand, every such assassination attempt, regardless of whether it is its successful or not, is taken advantage of by the present regime to apply more violent terror, which can lead only to evil. Thus, the dispute over the possession of Macedonia is conducted over our backs, and it is only the Macedonians who suffer from such settlement of accounts, although they do no take part in it and condemn both sides." With the incorporation of Vardar Macedonia into the Kingdom of Yugoslavia, teachers and clergy who had not previously worked in Serbian schools and churches were regarded as undesirable. A considerable number of formerly exarchate schools were closed, and in the school year 1922/23 alone 130 schools were closed in the Vardar region. A formula of "dosed education" was applied, which would enable denationalization and "manufacture excellent Serbs". Through the schools and other institutions and organizations, the regime endeavored to strangle all Macedonian national consciousness and tradition, to root out the use of the mother tongue, and to distort history and ethnography. In carrying out enforced denationalization and assimilation, monstrous measures, terrible persecutions and mass terror were employed against the Macedonian people and against the Albanian and Turkish nationalities. Macedonians, Albanians and Turks lost their lives defending their human and national rights. By 1926, more than 1,600 people were executed without investigation or trial, while thousands of martyrs had been imprisoned. Parallel to the denationalization policy of the authorities, the Macedonian Question was chiefly addressed by the activities of the Communist Party of Yugoslavia (CPY). Ivan Katardzhiev stresses that "the policies of the Communist Party of Yugoslavia in respect to the Macedonian national question, despite a certain straying during the first years of the Kingdom of the Serbs, Croats and Slovenes, can not be treated separately from first, the complexity of the national question of the Yugoslav peoples within the framework of the new state; second, the relation of Macedonian representatives in the ranks of the Communist Party of Yugoslavia; and third, the viewpoint of the Vukovar Congress (1920) that 'the Communist Party of Yugoslavia will continue to uphold the idea of national unity and equality of all nations in the country'." On July 20, 1923, the Sarajevo newspaper Vecerwa posta (Evening Post) reported that "a new youth organization, 'Macedonian Group,' was formed in Southern Serbia". According to somewhat sketchy data, a number of democratic delegates from Macedonia took part in the formation of the group, led by Gligor Anastasov from Kavadarci, Trajko Arsov from Shtip and Dimitrie Chichevich from Prilep. The idea of forming a Macedonian party was aimed at "grouping the forces of people's delegates, in order that-as unified people's delegates-they might truly contribute to improving the unenviable position of Southern Serbia." In letters to the Parliamentary Club of the Democratic Party, Gligor Atanasov explained that this initiative was also prompted by the fact that "one cannot conceive of a lower level of decline and greater chaos and injustice... Macedonia is neglected in every respect..." In an interview with the Free Tribune, Atanasov states that "Macedonia, which most regularly fulfills its duties towards the state, is neglected in every respect. The question of public security, the agrarian question, road and railway traffic, the question of economic recovery, the emigrant question and many other questions of vital importance for the new province cannot come on the agenda of serious study and solution, for the simple reason that Macedonia does not have representatives in the parliament in a position-as a united whole with greater authority and less party passion-to point out the importance of these questions to the competent authorities." Many aspects of the formation of this party remain unclear, its political platform being one of them-particularly considering that Gligor Atanasov, after the disintegration of the Kingdom of Yugoslavia, joined (if not previously a member) the Vancho Mihajlov group, which greeted the Bulgarian occupation of Macedonia in 1941 as "a historic act". The Macedonian Popular Movement (MANAPO) emerged in 1936, founded by a group of Macedonian students and communists who passed a political declaration-which, unfortunately, is now lost. But the main principles of this movement have been preserved: to fight for the "recognition of Macedonia as an individual historical unit and the Macedonians as a separate people", and for Macedonia "to be a separate unit within the framework of Yugoslavia which would be transformed into a federal state community." In his "Letter on Serbia" dated November 2, 1936, Josip Broz Tito stressed that "... The platform [of the People's Front] must clearly and unequivocally emphasize the resoluteness that the right of all peoples to self-determination will be respected, i.e. not only the right of Serbs, Croats and Slovenes, but also of Macedonians and Montenegrins, as well as the right of the people in Voivodina, Bosnia and Herzegovina to decide for themselves whether they will retain their regional independence within the federal state." The recognition of the Macedonian nation by the Comintern determined the viewpoint of the CPY in respect to the struggle of the Macedonian for recognition. Although the Communist Party of Macedonia (CPM) was not created within the framework of the CPY, in the spring of 1939 the Central Committee of the CPY issued its position on the Macedonian national question: "it is beyond any doubt that the Macedonians are a seperate nation in the Balkans (they are neither Greeks, nor Bulgarians, nor Serbs)." In the meantime, the Macedonian language gained ground. In some newspapers with a leftist orientation, such as Zagreb's Our Newspaper and Skopje's Light, Our Reality and Our Word, literary works and articles in Macedonian were published. The Skopje theater performed a number of plays in either the literary Macedonian language or in dialects, including but not limited to productions of The Runaway and The Rich Man Theodos by Vasil Iljoski; Money is Murder, Antitsa and Millions of Martyrs by Risto Krle; and Migrant Workers by Anton Panov. The appearance of White Dawns by Kosta Solev Racin fulfilled "a historical necessity-at the time it was published, this collection of poems signified the culmination of the drive toward the definite establishment of the Macedonian language and toward gaining recognition of Macedonian national culture in general." White Dawns heralded "the awakening of a people, which, in its struggle for a better life, had matured to creating its national culture." Events in Macedonia were not completely ignored in the outside world. André Vaillant, a great French Slavicist, wrote in 1938 that "...The term 'Slavonic Macedonian' is unclear only for those who want it to be unclear. The Slavonic Macedonian represents reality to such an extent that in the 19th century there existed a Macedonian literary language, the language of a very small among of learned literature but of a rather abundant folk literature. It is not a question of documents and folklore as can be collected anywhere: the lyric Macedonian poem, highly esteemed in Serbia and Bulgaria, represents an authentic literary genre of real value. This literary language, based on dialects which naturally differ somewhat from each other, did not have sufficient time unify. But its centers were Skopje, Tetovo, Ohrid, Bitola (Manastir), Voden (Edessa), etc." In that same year the Polish Slavicist Mieczyslaw Malecki concurred with Vaillant, "...However, it should be added that, beside the Macedonian characteristics which mirror the developments of either the Bulgarian or Serbo-Croat languages, there are also entirely individual features which, in such form, do not appear in either of those languages [Bulgarian and Serbo-Croat]. For that reason, my reply to the question whether the Macedonian dialects are Serbian or Bulgarian would be that they are neither Serbian nor Bulgarian, but the majority of them represent an individual dialectal type (which could also be named a Macedonian language), tied by strong knots of kinship to the two languages. Macedonian is a transition between the Serbian and Bulgarian, and its attachment to only one of those languages is baseless from a linguistic point of view." Irrespective of the issue of recognition, the national consciousness of the Macedonian people was already strongly developed. The violent dialogue between a group of young intellectuals and the Serbian professor Nikola Vulich in 1940 when the latter publicly denied the existence of either Macedonia, a Macedonian people or a Macedonian language (as well as the reaction his denial caused) was clear evidence that it was political and international conditions which prevented the Macedonian people from obtaining recognition. The numerous leaflets, appeals and proclamations passed by the Regional Committee of the CPM and other left-orientated organizations and movements are an indication that there was no question-at least for the Macedonians-whether they felt themselves to be Bulgarians, Serbs, Greeks-or Macedonians. The Resolution of the Regional Committee of the CPY for Macedonia stresses: "only a free and independent Macedonia can guarantee the freedom of all suppressed and enslaved people in Macedonia." The Resolution of the Fifth Countrywide Conference of the Communist Party of Yugoslavia, held from October 19 to 23, 1940, calls the Macedonian struggle "...A struggle for equality and self-determination of the Macedonian people against the oppression of the Serbian bourgeoisie, at the same time revealing the true face of the Italian and Bulgarian imperialists and their agents, who, by way of demagogic promises, also wish to suppress the Macedonian people." At the beginning of October 1940, in his article "Balkan War Provocateurs", Tito wrote: "And today, while the destruction of the entire Versailles system is underway and the Bulgarian and Serbian reactionaries compete in a belligerent and pugnacious way whether Macedonia should be an ornament of the Bulgarian or the Yugoslav royal crowns, we must shout louder than ever to those instigators of war that Macedonia is neither Serbian nor Bulgarian. Macedonia, that suppressed country where the freedom-loving Macedonian people are exposed to the most cruel terrors, hungers, denationalizations and exploitations; have suffered under Serbian national hegemony for many years. That blood-soaked country is not here to serve as a decoration for someone's crown, nor to be a dowry of the Serbian or Bulgarian bourgeoisie, but to be free from national suppression. The Macedonian people are fighting for their national liberation and in that struggle they have made great human and material sacrifices so far. To this, as well as to any other suppressed people, no action whatsoever can crush their will for freedom, nor could it destroy their right to self-determination, the right to govern their fates by themselves. Neither the Bulgarian nor the Serbian bourgeoisie have any right to Macedonia." The Macedonian people already possessed a highly-developed sense of their individuality and right to independence and freedom when the fires of war flamed across the border, urged on by the attacks on Greece by Italy and on Yugoslavia by Nazi Germany.